This is a Neo Geo. A working, fully armed and operational Neo Geo. Made entirely of finely-crafted walnut. I don't know the precise moment master craftsmen and video games got together, but it's a union worth celebrating. 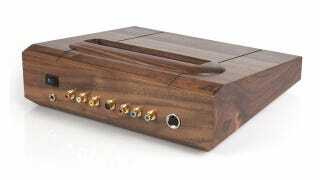 The entire console's casing is made out of walnut. Even the cartridge slot. Everything inside, though, is pure Neo Geo. Shipping next month, the console has a universal power supply, meaning whether you're in the US, Europe or Japan, you can order one and know it'll work on your relevant voltage. Such a great console with such a great finish was always going to come at a price, however: it costs $649. Expensive, but then, in a poignant touch $649 was the retail price of the Neo Geo when it was on the market for real.